On 21 February 1661, the 17th century diarist John Evelyn learnt from the German soldier and amateur artist Prince Rupert (1619-1682) ‘how to grave in mezzo tinto.’ One result of this activity was Evelyn’s Sculptura (1662), which contained the first announcement of the art of mezzotint, and which was the first book on the history of engraving published in England. This work also contains an allegorical engraved frontispiece designed by Evelyn himself and engraved by Abraham Hertochs, the Dutch engraver. Evelyn’s seated girl represents the Graphic Arts; Geoffrey Keynes, his bibliographer, called the image ‘painfully banal’. 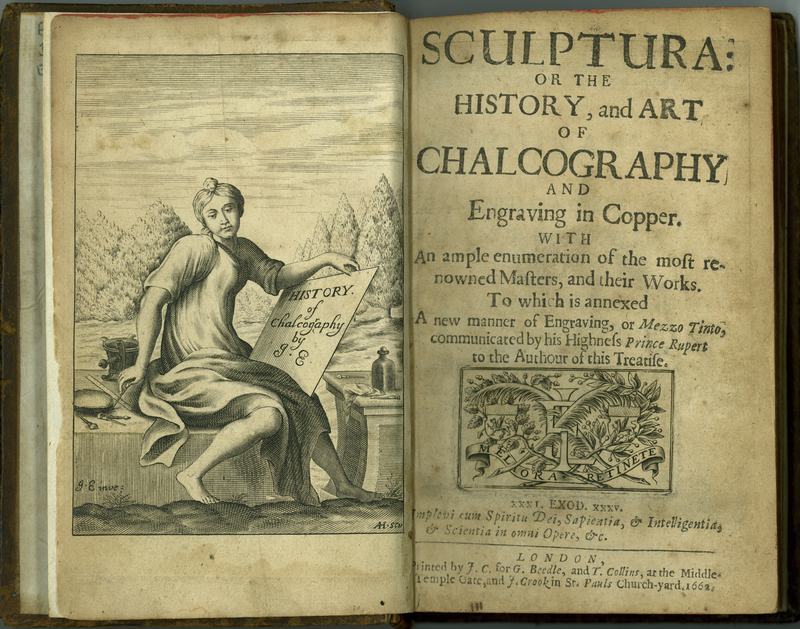 John Evelyn, “Sculptura: or The History, and Art of Chalcography and Engraving in Copper,” ourheritage.ac.nz | OUR Heritage, accessed April 24, 2019, http://ourheritage.ac.nz/items/show/10649.